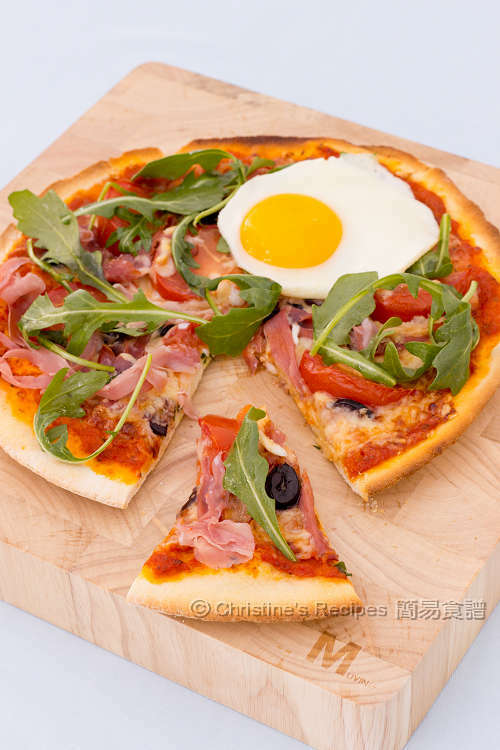 Ever thought that pizzas could be served as breakfast? To make a pizza, it only takes a bit of time and effort to get the pazza base prepared in advance. All other following steps are pretty easy and convenient. So, you can have pizzas in the early morning. Having said that, you can have it for lunch, or dinner, whenever you starve for it. 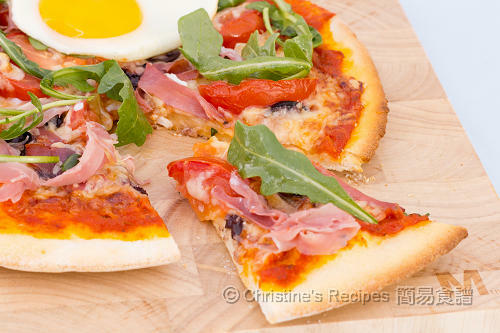 Pizzas can be very healthy as long as quality ingredients are used, cooked fresh from your oven in a few minutes. Heat butter and olive oil in a frying pan over medium heat, until the butter dissolves. Saute the onion until aromatic. Sprinkle Oregon. Pour tomato with juice and cook until thickens. Season with salt, sugar and pepper. Remove from heat and let it cool down. Blend in a food processor until smooth. Set aside. Lightly dust a clean surface with flour. Divide the pizza dough into 2 equal portions and roll each into a ball shape. Roll out each ball into a 20cm / 8 inch disc. Prick the pizza base all over with a fork. Lightly brush with olive oil. Spoon the pizza sauce and spread evenly. Sprinkle cheese, arrange black olive, tomato and shredded ham. Sprinkle extra cheese. Bake the pizza in the preheated oven for 10 to 12 minutes, or until the cheese melts and the edge turns golden. Meanwhile, cook the eggs one by one in a non-stick frying pan until cooked to your liking. Toss the rocket with the olive oil and lemon juice. Carefully remove the pizza from the oven. Garnish with the fried eggs and dressed rocket leaves. Serve immediately. You can make the pizza dough well ahead. Wrap in plastic wrap and store in freezer for up to a few months. When you’re ready to make pizzas, simply remove the pizza base from the freezer and place in room temperature with the plastic wrap, for about 20 minutes. Just follow the above instructions to ensemble and bake the pizza. 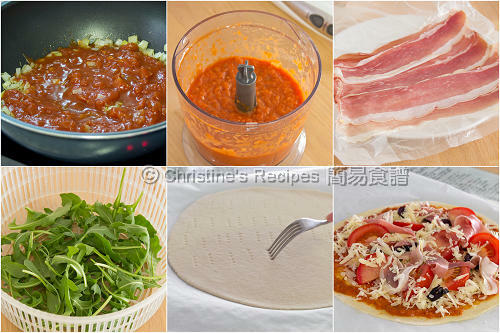 Pizza sauce can be made in advance. Store in fridge for up to 1 week. Prosciutto is a kind of Italian ham, available at supermarket. It can be replaced by salami or bacon. Hi, thanks for sharing so many wonderful recipes and tips. I learnt alot from you and the photos were great. A healthy breakfast pizza! Love the arugula leaves. You're so amazing:D I'll go HK for your book at Christmas! All the best come to you! What a great breakfast idea. Would be perfect for tailgates too! I love soba noodles and I love salmon: this recipe is a total winner for me! Can't wait to try it.